Tibet is land unlike any other. It is known as Khawachen Land of snow in Tibetan, are also called The roof of the world, The Forbidden kingdom and Land of enchantment by others. The Tibetan plateau stretches from the Karakoram in the west to the rugged jumble of range and river gorges in the east. The Himalaya bend around its southern border and the Kunlun ranges on its north-west boundary, within this area lies a unique and diverse geography that is matched by an enduring and dynamic culture. There is an aura of mystic that surrounds Tibet because of its inaccessibility, austere environment and powerful Buddhist culture. And while Tibet remains a special and fantastic land, it is now a place that may be visited and explored by anyone who is willing to endure to its evaluations. A drive across Tibet is a journey across the moon, the landscape will look like infinite variations on the colour brown. The roads are rough, dusty, unending but never dull. We at Lobens Expeditions are dedicated to providing the best possible service for this lofty exploration. Given the immense range of area in Tibet there is potential for trekking, traveling or climbing year-round, though the best season are late spring (Mid April to early July) and Late August through October). The only travel permitted to Tibet is in organized groups. 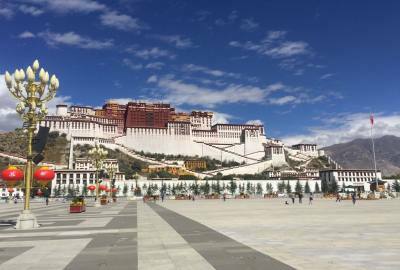 Only when you book a tour is the Tibet visa is issued. This is not as limiting as it sounds as groups of just one person can easily be arranged although it is more expansive to do so. All our trips to Tibet are coinciding Kathmandu Lhasa flight on Tuesday and Saturdays. All programs can be done reverse though it is not so good for acclimatization. Travel beyond Lhasa can be wearing and wearying. There are few paved roads and the rest are hard packed sand or gravel tracks and the dust invades everything. Once onto the Himalaya proper, roads are subject to landslides and snow drifts.